Congrats on your engagement, girls. As a bride-to-be, soon you will start your wedding dress hunt. If you include those who avoid strapless style and don’t like spending thousands of dollars to get gowns that most likely you would wear only once; you will face hard times during your wedding dress search. The truth is; though Kate Middleton’s gown has turn long sleeved wedding dresses becoming more popular nowadays, the strapless bridal gowns are still the most common style at many traditional bridal stores and this long trend seems will not change in a short time. Actually lots of girls out there don’t like strapless styles and find it uncomfortable to wear. Yeah, this kind of dress doesn’t make every wearer looks good in it. So, if you are a sleeve-loving buyer and it’s not easy to find alluring non-strapless choices at bridal boutiques that meet your budget; what is the solution? Buying wedding dresses online could be the best decision since you will find a wide variety that offered at more affordable prices. In this case, you should look into Dressilyme wedding dresses collection that contains more than 7000 lovely designs. Moreover, you can find a special collection at Dressilyme that you really desire for your dream wedding gown: Long Sleeves Dresses! There are various possible reasons why a bride prefers to wear long sleeves gown. It could be caused by religious, traditional, or other personal motives. Your own reason could be anything, no matter what it is; a sleeved bridal gown will surely give you classic and elegant look on your wedding day. This online dress maker and boutique offers awesome designs of armed bridal gowns in long sleeves, ¾ sleeves, half sleeves and also wedding dresses with jackets. I’m sure that you will love their collection. I have seen long sleeves Dressilyme wedding dresses and I was amazed. I’d like to feature here two designs that attracted me most. 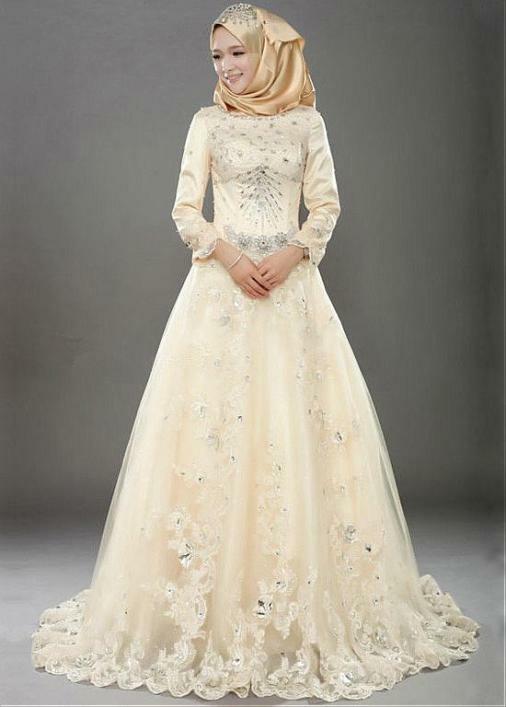 Check out above product images, the first choice is an Islamic wedding dress that seldom to find at other online bridal stores and the second one is because of its best price -lower than $100! If you have discovered the whole collection and you couldn’t find the design that you wish for, don’t worry, there is still a way out. You can try their custom dresses service. What you have to do is contact the dress maker to send the photo of your dream dress along with your measurements and preferred color. Custom wedding gown definitely will flatter you perfectly and next thing you know, everyone is praising your elegant look!